I am writing to inform you of the district’s need to eliminate $1.4M annually from our budget should Issue 8 fail on November 6. While we are confident the issue will pass, it would not be responsible to move forward without a plan if it were to fail. These are not reductions that we take lightly, but they are necessary to preserve what we value the most, and that is educating our students. 1. Closure of Campus Outside School Hours - Effective January 1, 2019 all buildings and grounds will be closed outside of regular school hours. Middle and High Schools will be open Monday-Friday, 7:30am-2:45pm. Elementary School will be Monday-Friday, 8:40am-3:40pm. There will be no evening and weekend use of the buildings and grounds. 2. State Minimum Busing - Effective for the start of the 2019-2020 school year, busing will be reduced to State minimums per Ohio Revised Code 3327.01. State minimum transportation only requires transportation for students in grades Kindergarten through grade eight (8) living more than two miles from the school. As defined by Ohio Administrative Guideline 3301-83-01, anyone living within two (2) miles of the school will not be transported to and from school. 3. Elimination of All Extra-Curricular Activities - Effective for the start of the 2019-2020 school year, all sports, clubs, band and extra-curricular activities will be eliminated. These reductions will save an estimated $550,000 annually. An additional reduction of $850,000 will be made through the elimination of our 1:1 technology program, field trips and further staff reductions. 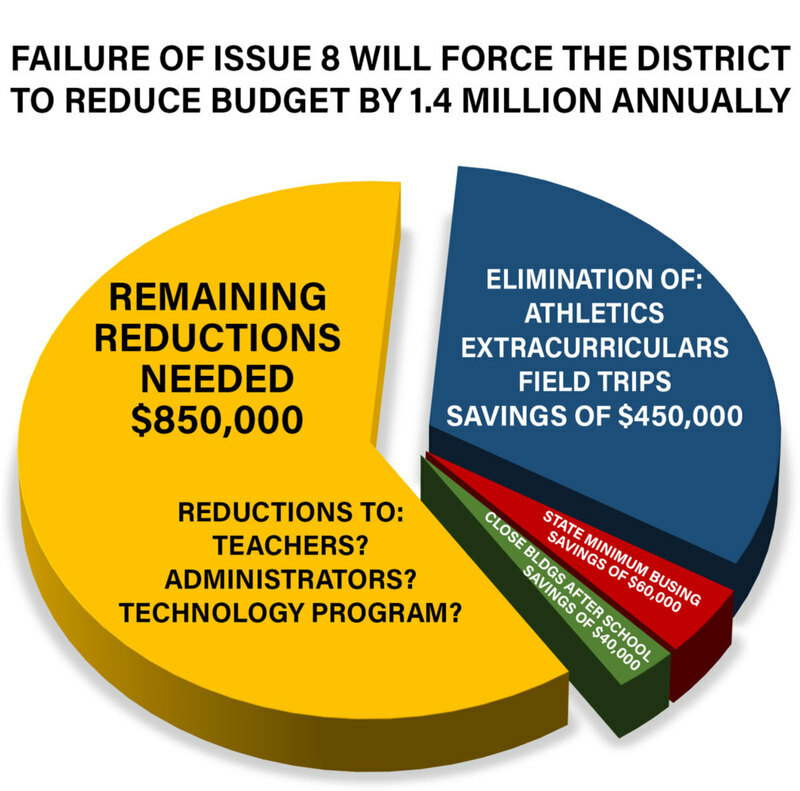 These potential reductions are all unfortunate, but our district runs on very thin margins, and we will need to implement each of these reductions in order to achieve an additional $1.4M deficit. The chart below outlines the specific cost savings of each reduction that will be taken should Issue 8 fail on November 6. We are sharing this information because we know that it will negatively impact many families and we want to provide ample time to plan. Should you have any questions, please feel free to contact us directly.